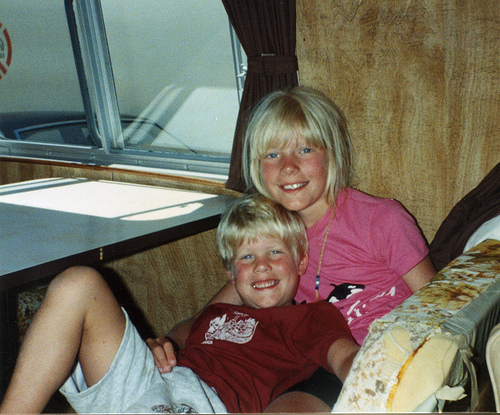 Our annual family summer vacations were never a far distance from home, but camping on Hornby Island felt like being in a whole other world. Rolling fields, white sandy beaches, aquamarine water and locals with character were all part of the experience. It was a virtually untouched – and unheard of – slice of paradise. 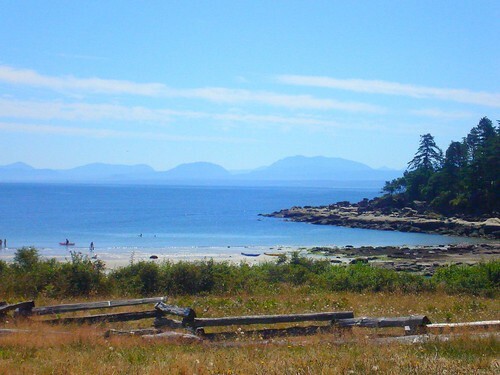 Each summer for more years than I can remember, spending a week on Hornby Island was a priority for our family. Our first outing was a straight-up learning curve, having neglected to bring tarps only to be caught in a downpour on our first night. After that trip, we became well experienced and well prepared campers, skills I hope have been passed on to me. Yesterday I excitedly booked three nights in July at the very same campsite that was the site of the downpour. J has never been to Hornby Island and I’m giddy with anticipation over stretched-out days on the beach, bike rides to Helliwell Park, ice cold beers from the cooler and more campfire s’mores than I can dare to stuff in my mouth. It’s always better to take just what you need instead of too much. Make a detailed list and consider whether you truly need an artillery of make-up or a stack of magazines. Get in touch with nature… naturally! Weather on the coast is unpredictable: sunny one day, pouring rain the next. Bring appropriate attire and lots of socks! Always obey fire regulations! Forest fires are common in the summertime, so if there’s a ban, respect the forest. That also means butting out cigarettes. Book early! Camping is a popular activity among Islanders and campsites fill up incredibly fast. Dogs are part of the family and love to vacation too. Though Jordy will stay with my mom, if your dog tags along, there are safety rules to follow. Keep your dog well hydrated with plenty of shade and space to rest. The sun affects them too. Also never, ever leave your dog unattended at the campsite – especially where there’s wildlife! Water can be a scarce commodity during summer months, especially on gulf islands and on the west coast. Bring as much bottled water as you’re able to. “Keep your chips in your tent, ’cause deer really like salt & vinegar.” – Devon D.
“Lots of tarps… and bring firewood.” – Kathy M.
“Put a flannel sheet in your sleeping bag, it will keep you extra warm, and rolls up nice with your bag.” – Debbie R.
Got any great tips to share? Add them below! I’ve read that Citronella is a bear attractant so.. if you’re in bear country it’s best to avoid using it. If you can, dig a little moat around your tent (or ground tarp) and have it lead (downslope) away from your tent. If it rains, it iwll hopefully keep your tent floor dyer as it should lead the rain water away. Preparing for rain is definitely one thing I’ve learned while camping in Vancouver! You just never know when those clouds are going to open up! It’s also handy to go camping with a couple of true woodsmen (Dario & Pat) who have every swiss army knife, pot, pan, tarp, fire starter, and tent you can imagine! Those two are prepared for anything. If you’re car-camping and not concerned about weight, don’t bring a case of bottled water. It creates too much unnecessary waste. Instead, buy a large 18L jug and fill it from the tap before you go. When you’re not using it for camping, you can keep it as part of your emergency preparedness kit at home. Also, if where you’re camping is backwoods and/or doesn’t have washrooms, make sure to pack a spade so that you can dig a cat hole for using the bathroom in.